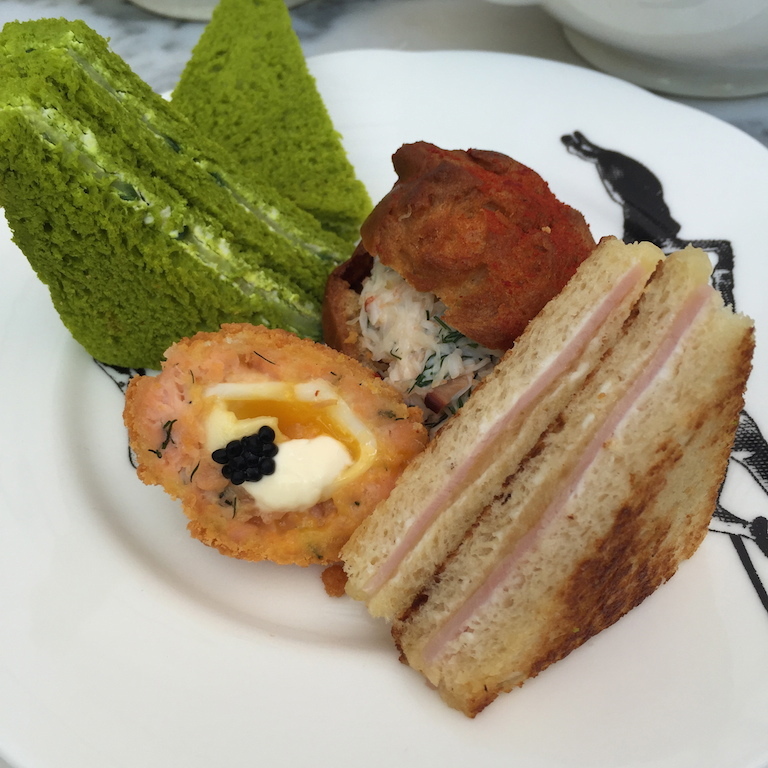 Blue Caterpillars, caviar scotch eggs and applewood smoked croque-monsieur. Not exactly the traditional fare one expects to find on a table set for English high tea, but find it we did. High Tea is often thought of as a ‘touristy’ London activity, but I assure you, this English ritual is steeped in tradition, and any tradition that includes Devonshire cream, sweets and exotic aromatic teas is not one I want to miss out on. Full disclosure, the main reason I chose the Sanderson was because Claridge’s and the Palm Court at the Ritz were booked up until September. 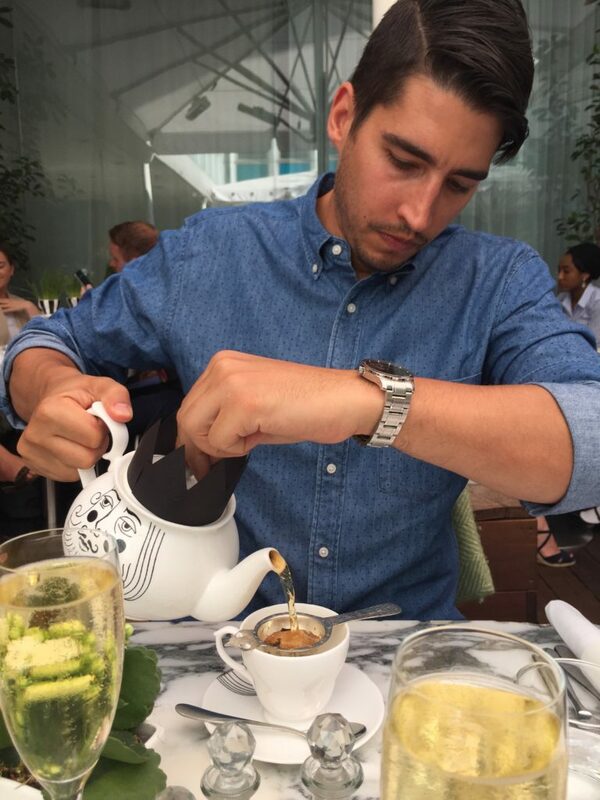 My beau had never experienced a proper high tea, so I was a little disappointed when the preferred venues weren’t available. However, when I heard the Sanderson was celebrating the 150th anniversary of one of my favourite childhood books, I couldn’t wait to tumble down the rabbit hole. 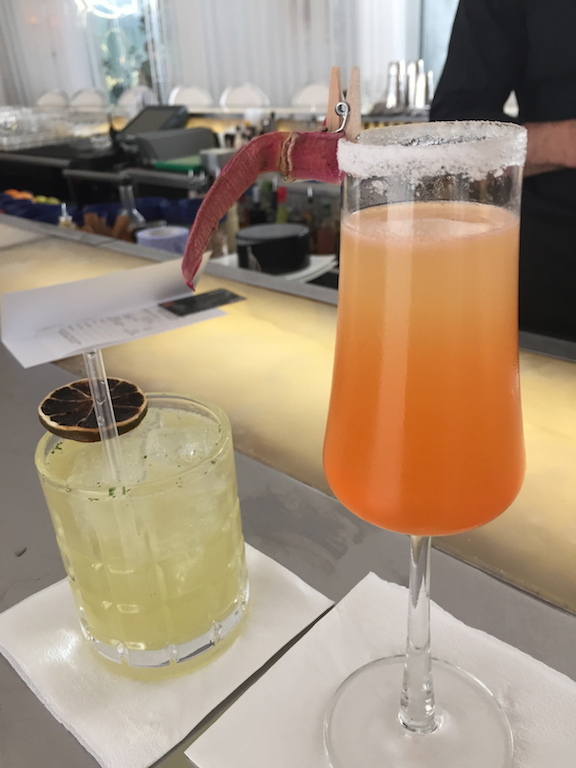 Channeling our inner March Hare, my beau and I arrived a tad early for our reservation after having spent the morning at the British Museum, a ten minute walk away. To pass the time while we waited for our table to be ready, we took a wander through the lobby, and put the bartender to work fixing us a couple of signature Sanderson cocktails. 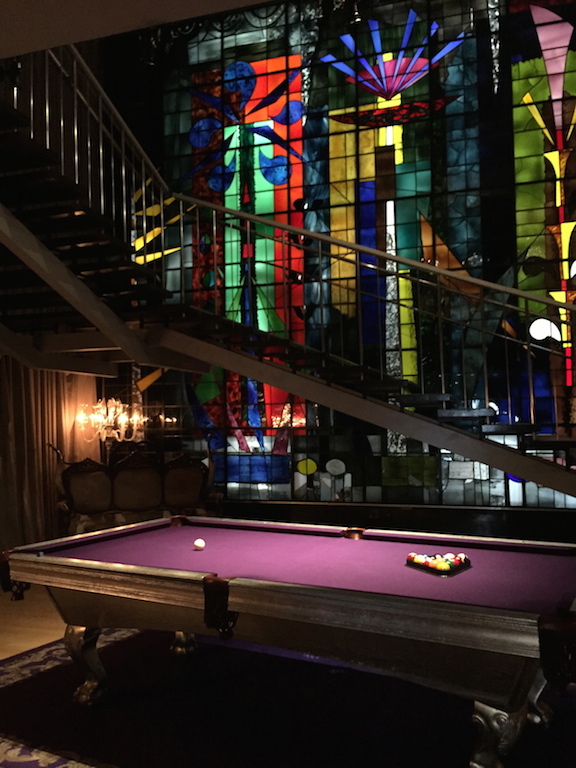 The very open and peculiar lobby aesthetic is unmistakably Philippe Starck, with a sort of provocative Mad Men feel to it; Industrial meets storybook. And while it didn’t feel like a traditional setting for High Tea, its uniqueness was quintessentially Londonesque. Half way through our drinks, (after recovering from sticker shock, and paying a staggering CAD$27 per per drink), we were escorted into the garden for tea. Once seated, we were greeted with a warm smile and two vintage storybook menus. Our attention was then directed to five potioned bottles, adorned in multi-coloured yarns, complete with themed descriptions. We aptly chose “Alice” and “Mad Hatter” for our teas, kept our eye out for the Cheshire cat, placed friendly bets on who would upset the Queen of Hearts first, and wondered who whose teapot would be home to the snoozing Dormouse. First came a generous pouring of champagne – There’s nothing like bubbles to set the mood. Next came the beautifully themed crockery adorned with faces of the King and Queen of Spades, both brimming with rich, aromatic black teas. I found out later that you can actually purchase the full tea set from Luna & Curious for a mere £400 (CAD$690). 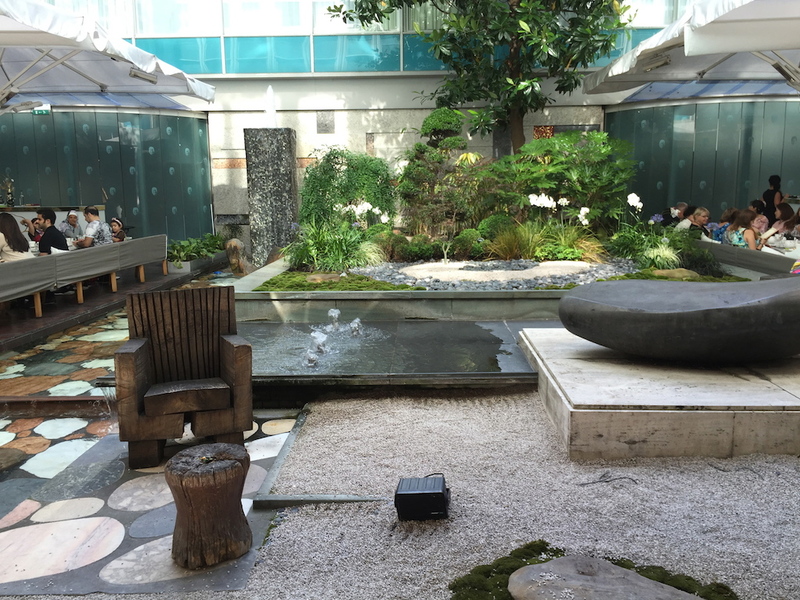 The modern ambiance was not nearly as impressive as the Palm Court at the Ritz, or as chic as the Art Deco foyer of Claridge’s, however, the garden at the Sanderson is more reminiscent of an ocean club in the heart of South Beach, Florida. Faux marbled tables sat tucked beneath fabric awnings, spread out over a terrace, all surrounding a water feature in the midst of an open courtyard. It is a rare occasion that Londoners are able to enjoy the elements, and on this warm and summery Wednesday afternoon, there was no better place to be. With steaming hints of cinnamon, vanilla and bergamot unfurling from our cups, a selection of savouries were placed before us; Scottish smoked salmon, quail egg and caviar; Wiltshire ham and smoked applewood croque-monsieur; A whimsical take on cucumber sandwiches on vividly green lime bread; And the pièce de résistance, a cornish crab and herb eclair. 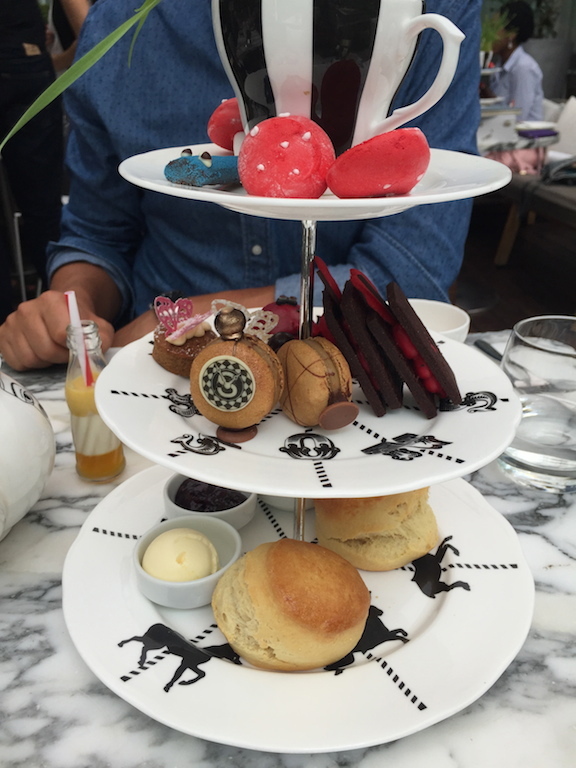 Next up, an over-the-top take on a beloved British tradition; A tiered tray of sweets. Like a shameless paparazzi swept up in a tornado, I circled the the tray, snapping from every angle imaginable. It wasn’t until I looked up and noticed the raised eyebrows sitting across from me, “Are we on safari or something?” Traveling with a travel writer (or travel agent trying to document every moment for their clients) can be both amusing and irritating; I sheepishly put my phone away and dug in. Things were about to get topsy turvy. 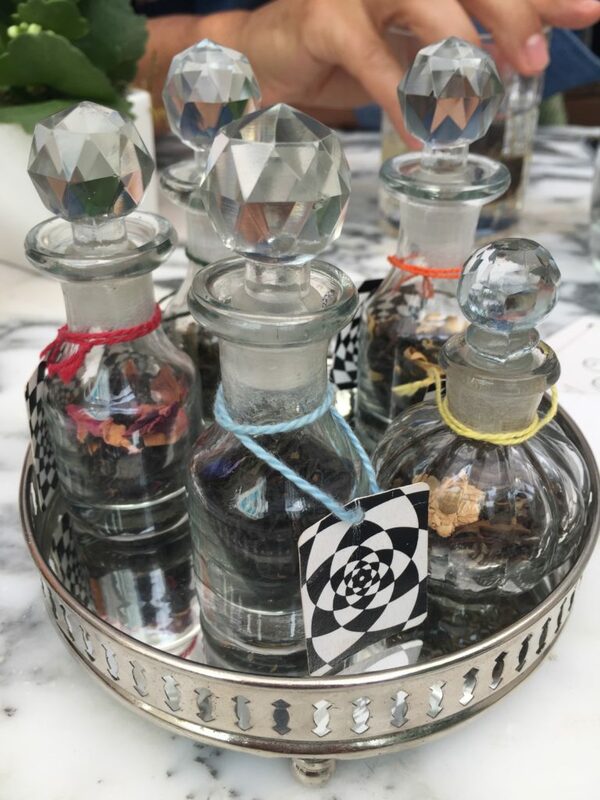 Red velvet ladybirds; Magic mushrooms, Queen of Hearts Oreo cookies; And of course, Alice’s ‘Drink Me’ potion – Each sweet was painstakingly ornate, hand-painted, baked to perfection and straight from the pages of Lewis Caroll’s masterpiece. 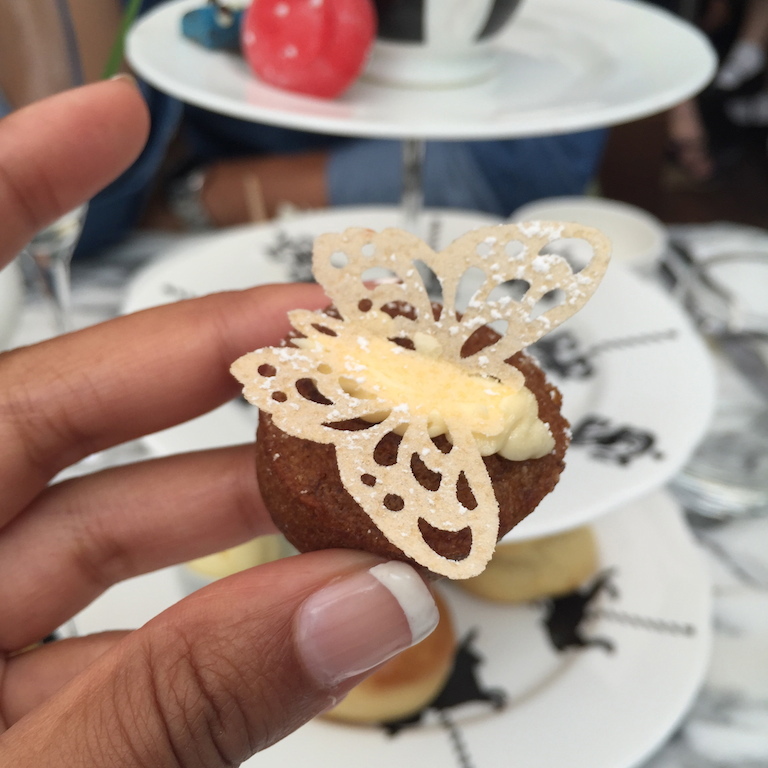 And finally, at the bottom of the multi-tiered tray of Mad Hatter confectionaries sat two freshly baked scones, complete with cornish clotted cream and fruit preserves, the perfect bookend to a truly opulent and fun high tea experience. 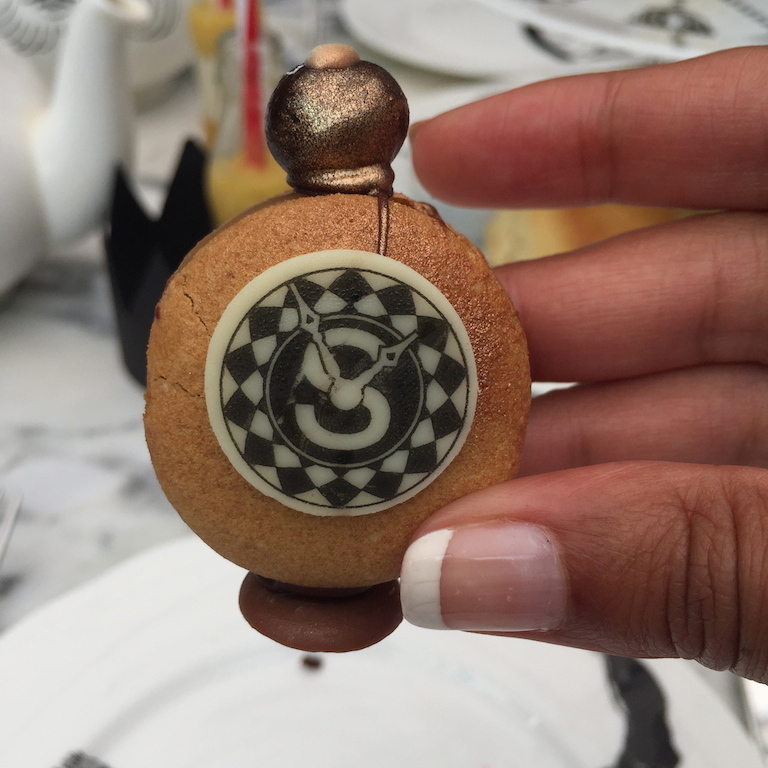 On every trip, there’s always that one meal or experience you talk about for years to come; The Mad Hatter’s Tea at the Sanderson was one of those experiences. I can think of no better way to pay tribute to one of the most beloved children’s stories of all time. The Mad Hatter Tea at the Sanderson took a concept which could have been uncomfortably kitschy, but instead, ended up feeling nostalgic, sophisticated, and fun. 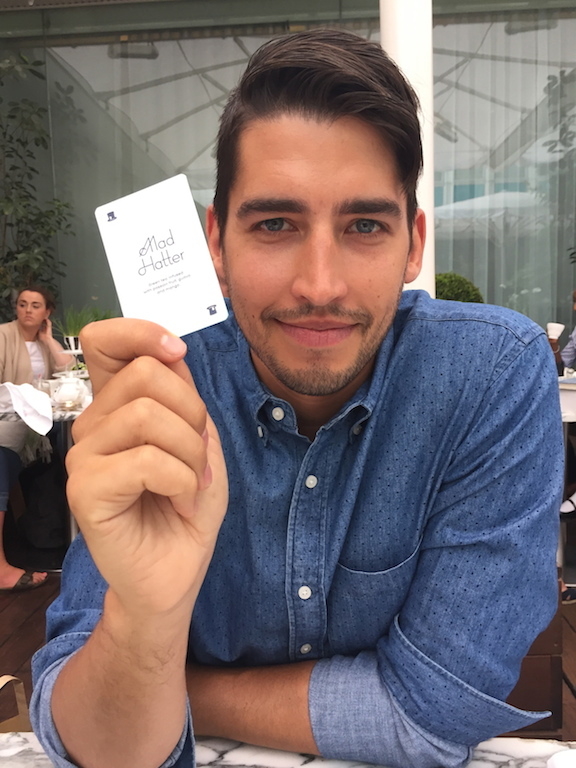 Need reservations at the Sanderson? All you have to do is ask! Provide me with a date range and I’ll make it happen.